In the Thought Leaders pink sheet process the metaphor is the abstract right brain tool we use to capture, package and deliver ideas and insights. In this month’s Talking Point I thought we could take some time to make metaphors a bigger part of your leadership world. One of 5 major tools we unpack on the IP-capturing tool we call a pink sheet, metaphors are something you either get or not. They will come easy to those who live in the big picture and lean to the right creatively. But if they don’t, don’t worry – it is definitely something you can get better at and as a leader should be using regularly. (And don’t worry, I’m not as pedantic as your English teacher about the metaphor-simile distinction, either is fine. For simplification purposes, let’s stick with the title ‘metaphor’.) Spend some time this month thinking about metaphors –turn on your awareness to how prevalent and powerful they are. This Talking Point is a modified excerpt from my most recent book, Think – Using Pink Sheets to capture and expand your ideas, written with my business partner at Thought Leaders, Peter Cook. The power of a metaphor is the picture it creates in the audience’s mind. This picture cannot be directed by you too much but rather it is connected to mental pictures that already exist in the individual audience members’ minds. The connection and subsequent mental images are co-created. It’s a collaboration between you as the messenger and them as the audience. This giving away of control as the leader is actually what makes the metaphor such a powerful tool. Sometimes you might find that the metaphor feels forced, like a swollen foot in a dried-out boot (wink). So, what should you do if the metaphor doesn’t fit? Let go a bit. You may have become attached to a cute metaphor that you like, even though it isn’t the perfect metaphor to make your point. Metaphors need to land a message, more than grow it. Metaphors need to land a message, more than grow it. This is why we need to be careful not to mix our metaphors. Each metaphor needs space and room to breathe. The power of the metaphor is diminished by crowding it with too much detail, a different metaphor or a somewhat laboured personal story. The connection the audience makes through a metaphor is more powerful than the words you say as a leader. 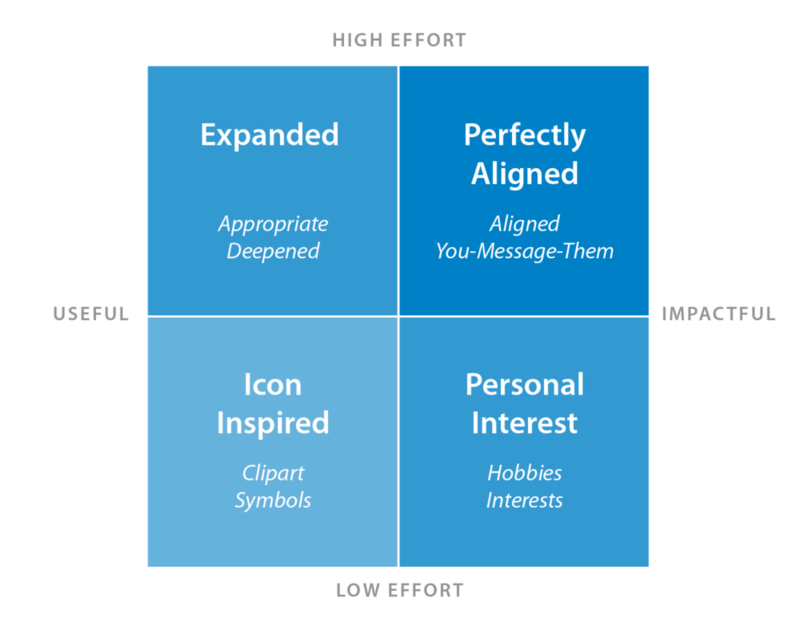 For simplicity let’s say that there are four types of metaphor: These include the icon-inspired metaphor, the personal interest metaphor, the expanded cliché metaphor and the perfectly aligned metaphor. The connection the audience makes through a metaphor is more powerful than the words you say. Metaphors are symbolic, iconic, and oftentimes, they are clichés. A cliché is an idea that feels archetypically true and as such, while you risk the cynic’s derision in using them, they are often the perfect place to start. If you find yourself interested in a cliché then try to possess it, to make it your own and labour over it. They are clichés because they hold truth and shared understanding that you can use to make your point more powerful. Three common metaphoric clichés are icebergs, compasses and driving. Icebergs are often used to communicate deeper meaning, compasses are often used to communicate purpose and driving is often used to connect to the idea of learned competence. Remember, metaphors are a collaboration between you and your audience. A second place to explore metaphor is to look at icons and clipart images. Take any slide tool, such as PowerPoint or Keynote, and glance through the clipart options. You will see light bulbs for innovation, gears for work and podiums for public speaking. A clipart image is iconic and, as such, perfect for the role of metaphor. If the embedded clipart native to your software system is not expansive enough, you can google icons and have the same effect. Remember, metaphors are a collaboration between you and your audience. Tell them and let them produce a much more powerful image in their head than any that you could put on a slide. You can also use your personal interests and hobbies as a source of metaphor. This has the added benefit of making you, as the author of the ideas, accessible. By sharing something about yourself in service of the audience's understanding, you get a double win; rapport and education. I love knives; indeed, some might say that I have an unhealthy fascination with them. I will often explain that a well-articulated point is like a single-edged carving knife; the initial statement should cut through the fat and grab someone’s attention while the explanation that follows should be the separating blunt edge of the knife. The point (wink) is that when I am discussing knives, you get to see more of me, and as a result, you get the message and a bit of the messenger at the same time. The fourth idea, and perhaps the ultimate goal, is to create perfectly aligned metaphors that add layers of depth. These two tools, the model and the metaphor, are inseparable. This is the metaphor sweet spot, and when this happens, angels sing. It’s not always possible, but it’s something worth pursuing with your big ideas. 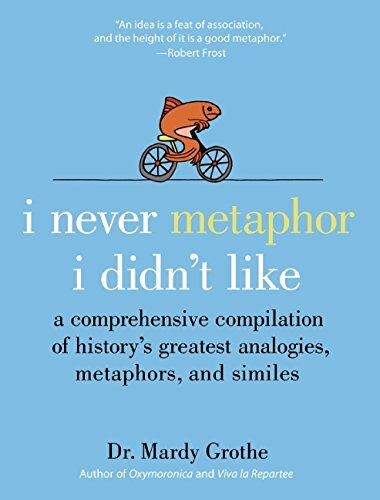 A great book for going deeper on metaphors is I Never Metaphor I Didn’t Like by Mardy Grothe. Metaphors are like the icing on the cake (double wink). You will find metaphors are everywhere and once you embrace them, you will be stunned at how prevalent they are and how useful the habit of crafting them deliberately as a leader can be.